Steak Sandwiches...Yummm! I loved this sandwich...It was so flavorful! I used the Artisan Five Minutes a Day Bread rolls for this sandwich. Simple to make using any other bread as well. Hope you enjoy..
1. Heat a skillet on medium heat and add 2 tsp olive oil. 2. Add sliced onion and saute till almost soft and golden turning every so often so as not to burn. Remove to a plate. 3. Add 2 tsps olive oil and sliced mushrooms. Saute till nicely browned. Add onion and mix together. Turn off heat. 4. 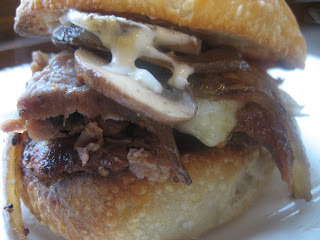 Assemble sandwiches with steak mushroom /onion. Top with some grated cheese and broil 'til cheese is melted. Add top of bread that has been spread with mustard and mayo mixture. Enjoy!